After being dis-invited to their senior prom, the Liars decide to host their own low-key version in Spencer’s barn. Sadly, Caleb jets off to New York without much explanation and Sarah’s own prom is scheduled the same night, leaving Hanna and Emily dateless. Thankfully, things are looking up for Aria. Not only does Ezra accept her offer to attend the girls’ makeshift prom, but Aria also finds out that she won the photography contest, which means she’ll be leaving for her internship in L.A. come summer. 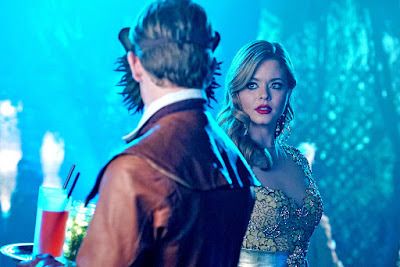 Oh so fitting to the “Enchanted Forest” theme, Alison arrives at the festivities looking like the Belle of the Ball. Her stunning entrance isn’t lost on Clark, who all so suspiciously happens to be the photographer for the event. Back at the barn and clearly in boredom, the Liars check out all their classmates’ posted prom pics on their cells, and Emily spots Ali in one of the shots. With too many servings of wine already underway, the Liars’ mothers are completely oblivious to what’s happening literally right in front of them as Aria, Hanna, Spencer, Emily, Toby, and Ezra all manage to skulk off undetected to prom. Forget the tipsy mothers for a moment. How did the police officers stationed out front not notice six people all leaving the property at once? Clearly, the gang didn’t hoof it to prom, so you’d think Rosewood’s finest would see them taking one of their cars and driving off. Ali peruses the dance as more taunting texts pour in from “A,” telling her to seek him out. Just as she’s about to close in on her brother, Spencer intervenes. Knowing full-well what Charles is up to, Spencer urges Alison to walk away while she still can. Ali immediately rebuffs the advice, demanding that Spencer stays out of it. All Alison wants is answers, and she’s determined to finally get them. Everyone splits up to survey the room, keeping Alison in sight as she continues searching for Charles. Caleb crashes the party, looking quite smashing, filling Hanna in on what his mysterious trip was about. Apparently, he’s been offered a high paying job working as an information risk analyst. He invites Hanna to move with him to New York, which she gladly accepts. Toby and Spencer patch things up as well, but things don’t look so good for Team “Ezria.” Aria decides to go through with her L.A. plans to L.A.; Ezra joins Habitat for Humanity. After an entire summer of unanswered questions and melodrama clogging the run-time, PLL finally regains its footing with “Last Dance.” Though nothing is actually revealed to us, the rising tension woven throughout the entire episode makes for a gripping viewing. Its magnificent direction and cinematography coupled with the enchanting costumes and set pieces recaptures the series’ allure that had been noticeably absent for most of this season. All that’s left now is to speculate one last time over who’s really hiding underneath that notorious black hoodie.